is a ripe number, suggesting a pregnant pause before a major transformation – Moses and the Israelites wandering 40 years in the desert, Jesus’ 40 days of temptation. What do we learn from their teachings, a generation since their deaths? The two of them were, in their day, an odd couple. King was a product of the black Baptist church, raised in the oppressive confines of the Jim Crow South and the crucible of American racism. Heschel, descended from a long line of Polish Hasidic rabbis, fled Nazi-dominated Europe (where most of his family was killed). A towering Jewish intellectual, theologian, and mystic, Heschel brought ancient Hasidic spirituality into the tumultuous world of social activism in the 1960s. Given his writings on the religious struggle of the modern person in a confusing world, and on the urgent relevance of the ancient Hebrew prophets, it was no surprise that he found a kindred spirit in King. Today, religion is often divisive (even violently so); in the 1960s, Dr. King and Rabbi Heschel modeled a friendship rooted in deep admiration and mutual affirmation of their respective spiritual traditions. Today, we debate the role of religion in the civil arena – usually resulting in rancorous and judgmental culture wars; King and Heschel were public theologians and spiritually grounded activists, witnessing to the power of faith in the service of social transformation. Heschel and King worked closely together in spiritually rooted prophetic opposition to racism, poverty, and militarism in American society. Like the biblical prophets, they spoke truth to power – but also spoke truth to the disempowered, who can only win their fair share of democratic power by learning and acting on the truth. They spoke truth to their own supporters, even when those supporters urged them to hush – as many did when they spoke out against the Vietnam War. The two of them witnessed to the absolute unity of means and ends, as embodied in nonviolence. The two of them likewise demonstrated a deep unity of prayer and social action. A biblical generation later, many Americans who likewise see the connection of faith and social transformation are drawing on the legacy of these two brothers. 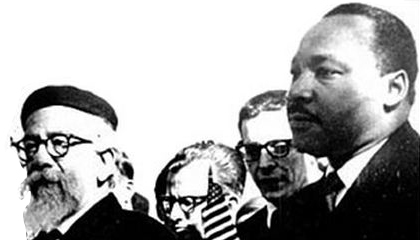 What issues would Dr. King and Rabbi Heschel address today? Perhaps the mass imprisonment of more than two million Americans, most of them black or Hispanic. Perhaps the breathtaking increase in poverty and economic inequality. Perhaps the horrendous violence in our society. Perhaps the physical and legal attacks on American Muslims and Hispanic immigrants. Perhaps the government dysfunction that threatens our financial stability. Perhaps our collective failure to address the climate crisis that threatens the web of life, including human life, on our planet. as the ultimate answer to the crises of poverty, homelessness, addictions, and violence. They would translate the language of Torah, Prophets, and Gospels into a concrete and compelling vision of justice and peace for our world today. And they would not be content with rhetoric alone: In their generation, they modeled putting faith into action, and today they would urge us to collective action to address injustice and work for the common good. They would insist that any genuine vision must translate into concrete policies, legislation, and real public action. Forty years have passed since Dr. King and Rabbi Heschel worked and witnessed among us. Perhaps, like a biblical generation that represents a pregnant pause before a major transformation, we may be ready to act for a transformative rebirth in our time.